I’m a CMMA member and was recently asked to provide a written response to the question below. Because I share practically everything, below is my response. Hope you enjoy it. Does it still hold, or have technology changes and production efficiencies made it possible for communications media projects to be all three? We’d like to hear your opinion. We’ll publish your contribution in an article in the next issue of e-visions. If you think the adage still holds, tell us why. If you think some projects can be good, fast and inexpensive, give us examples. “Would you tell me, please, which way I out to go from here? That depends a good deal on where you want to get to, said the Cat. I don’t much care where…said Alice. Then it doesn’t matter which way you go, said the Cat.” – Lewis Carroll, Alice in Wonderland. As long as I can remember I haven’t liked playing by other people’s rules so if I may I would answer this question by only choosing one which is doing communication projects well (good). I always strive for good but I’m constantly striving for change and I don’t want myself, my department, or my company to ever be thought of anything less than good. If you want to go fast and be cheap you can be successful for a while but ultimately the things you overlook in the process will catch up with you. I have a young son at home so a lot of my time is spent watching children’s movies. I’m older now and am noticing that I’ve forgotten a lot of the lessons the movies of my youth taught me but the good news is I don’t think I’m alone. Having a child has taught me how to think like a kid again so when I saw the question of whether we as communications media professionals can have good, fast, and cheap media projects I had to chime in. Going back to kid’s movies, Alice in Wonderland can teach us a lot about making difficult choices. In the first few minutes of the movie Alice sees a White Rabbit running past her. 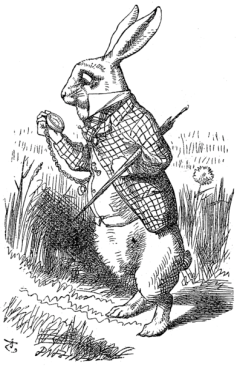 The White Rabbit proclaims “I’m late! I’m late! For a very important date! No time to say goodbye, hello! I’m late! I’m late! I’m late!” and disappears into a rabbit hole. Alice decides to follow him down the rabbit hole which in turn makes her fall to a hall of locked doors of various sizes. Alice can see through the lock of the small door a beautiful garden but she is much too large to fit through it. She therefore decides to drink a bottled with “DRINK ME” on it which makes her become so small she can no longer reach the key on the table. She then eats a cake labeled “EAT ME” which causes her to grow so large she can barely fit inside the hall. If you are like me you have a lot on your plate and you’re late, you’re late, you’re late! We have different paths (doors) to try and get our work done but we still seem to fit it all in. We are constantly juggling doing good, fast, and cheap work and it isn’t easy. On top of that we are in a recession and budgets are being reduced so doing things cheaply is likely at the forefront of many of our minds. However, with that being said I believe it still possible to have good, fast, and cheap communications projects. Times of recession and depression have traditionally been when society learns to do more with less. If you like change you’ll love recessions because traditionally they have brought periods of increased innovation. Because people are trying to do more with less communications professionals will start to reevaluate their service offerings within the companies they serve, as well as their processes. Companies who don’t have strong offerings will be absorbed, replaced, or dissolved by more compelling and/or cost effective solutions. The other thing recessions bring is accountability. People will need to start focusing on being productive rather than being busy. Below are some tips I’ve found over the years for balancing good, fast, and cheap communications. Whenever possible, choose good over fast and cheap. There is the old saying that “haste is waste” but old habits must die hard because only until recently have many communications professionals started to analyze the ROI of doing things quickly vs. effectively. Always try to think about the long term implications before making a major decision. Think about the last project you worked on hastily, how did that work for you? Speed can sometimes win out over doing it well but you usually can’t be successful if you don’t have lots of money to help you along the way. If you had a lot of resources to access when you needed to go quickly, have you noticed how speed has affected your motivation? In the famous tale The Tortoise and the Hare the tortoise boasts how fast he is but becomes so unmotivated to win he doesn’t take the race seriously. The Hare who slowly and methodically trudges along ends up winning the race. The turtle never lost the “eye of the tiger” and you shouldn’t either. Don’t rest on your laurels because speed can only get you so far. Don’t be fooled by the old saying that “you get what you pay for”. Today’s communication tools rival what cost then times as much just five years ago. If your company isn’t looking at what the industry is doing outside the company please let me know your stock symbol because I’ll make sure not to invest in it. Constantly look at trends and never think expensive always wins because in the end it isn’t how big your budget or communications tool is but rather what you are able to do with it and I truly believe that. I know this is going to sound “cheesy” but have you ever listened to the lyrics of the song “Sunscreen”? That song forever changed the way I look at the pace of life. Some departments are ahead of others, some are behind…the race is long, and in the end, it is all about showing value to your organization. 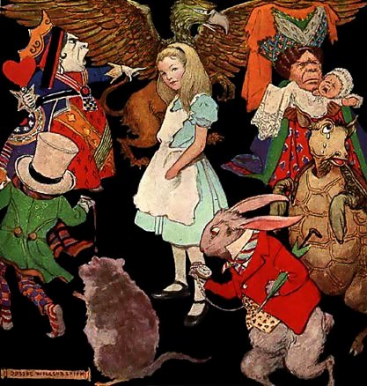 Remember Alice hastily following the rabbit who only focused on time down the rabbit hole. Rabbits are stressed about time, be the turtle and focus on finishing the race with purpose instead of simply crossing the finish line. Which way should you go? Good? Fast? Cheap? If you don’t know where you want to get to it doesn’t matter. 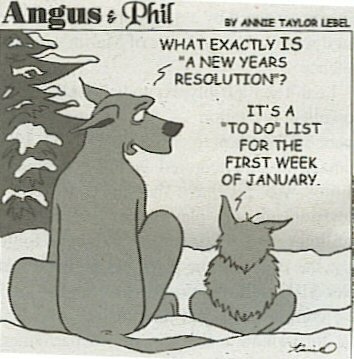 My 2011 resolutions this year aren’t going to be my typical resolutions. Here are my 2009 and 2010 resolutions. Not that I haven’t done this in years past but in 2011 I’m going to focus on continuing to just being happy. If something doesn’t make someone happy chances are they won’t do it. At work I create themes for each year and I think I said this year I want to focus on standardization but personally I want 2011 to be all about creating things to help the world where I can. Be happy. How do I measure being happy to know if I achieve it? I won’t, I’ll just be happy. Have a healthier balance of giving and sharing of information. Read more, get information if it isn’t given. OK I won’t, I love sharing, but it is worth a try. Mr. Tyler man don’t think I forgot about you. This year we are going to work on some computer skills, language, and continue your (OK my) love of baseball. Oh and we are going to play, play, play. FAIL – Back in 2009 I was really angry and really had lots of motivation and lots of things to get out. Back then I could get into the thirties. Now I’m happy and can do about 15 and I’m actually OK with that. FAIL – But Christina and I did finish our half marathon about 30 minutes faster this year than the last. FAIL – Epic fail, oh I hate making the bed every day and I haven’t. FAIL – Epic fail, oh I hate doing dishes even more than making my bed so I really haven’t done the dishes every day. FAIL – I don’t think I worked on any. Merry Christmas to everyone! This is by far my favorite time of year. I have had a great time up in Portland with my parents and Tyler and I have had some fantastic father/son time together over the last week. I even received Christmas cards in the mail from a few of you before I left and I’ve been unlike myself this year by not sending out any. For those who sent cards just know I really appreciated it. Anyone who I have come to know hopefully knows I care about you all (card or not) but if you don’t just know I do. Tyler is with mom and her family for the next few days so expect lots more posts. Jeremy Clark, I’m gonna get to you, I’ve been meaning to reply. Heck, I’ve been meaning to get back to lots of you but things have just been incredibly busy. You know I’m busy when I’m not blogging and you know I’m really busy when I don’t even have time to do an end of year video recap like I have in past years. I’m trying to get a better handle on managing my time and blogging has taken a “back seat” for a while to help me catch up on other things. You’re A Great Friend But If The Zombies Chase Us, I’m Tripping You! I attended a coaching workshop on Friday and I especially liked a portion of the workshop that talked about outcomes of various management styles. When we started white boarding we brainstormed the outcome of what happens when a manager tells, advises, and directs. Now after reviewing the outcomes above, can you guess which response Jeremy came up with? If you guessed zombies you’re a winner. I really said it and I really mean it and the purpose of this post is to discuss what I mean about the “zombie effect” in the workplace. Wikipedia defines a zombie as “a creature that appears in books and popular culture typically as a reanimated dead or a mindless human being”. 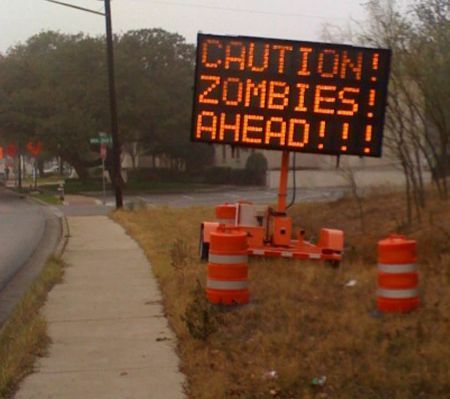 The scary thing is you are likely working with zombies and you may not even know it. Zombies that become infected with the zombie virus don’t bite a victim who then suddenly becomes infected. Instead, I’d argue that employees become zombies over the course of weeks, months, and even years. When it comes to the zombie effect, ignore everything you’ve seen in comics or movies. I’m an animal lover so know that no frogs were harmed in the making of the video (wait until the very end). Even though no frogs are harmed it is still a bit disturbing but if you know anything about me you know I like to help illustrate my point via multimedia examples. I’m a more of a visual learner and if you are too I think you will be equally fascinated by the video below of a frog in a pan of water. If you don’t have the heart to watch the video, you’re a better person than I am (I watched it). At the start of the video the frog sits calmly in a pan of room temperature water but the person performing the demonstration slowly turns up the gas burner beneath the pan. Because the temperature is slowly increased, the frog doesn’t notice the temperature increasing. Eventually the water starts to boil and the frog dies as a result. Organizations who do not listen of course aren’t going to say they don’t listen their employees but if they continually ignore the danger around them, eventually bad things happen. When I said not listening to employees and always directing them produces zombie employees the response in the class was laughter. Why do you think they laughed? I’d argue they laughed because in today’s workplace we have become accustomed to calling things by their politically correct names. When that doesn’t occur it catches people off guard. Therefore, you likely haven’t heard of zombies in an organization, you may have heard terms like employees being unmotivated, disengaged, or even being under-performing. Corporations are big ships so change happens slowly. Very few employees/managers/leaders in an organization stop to ask themselves: “hey, is it getting hot in here, or is it just me?”. If organizations aren’t doing pulse checks an organization can start losing its focus and ultimately lose its employees and customers. 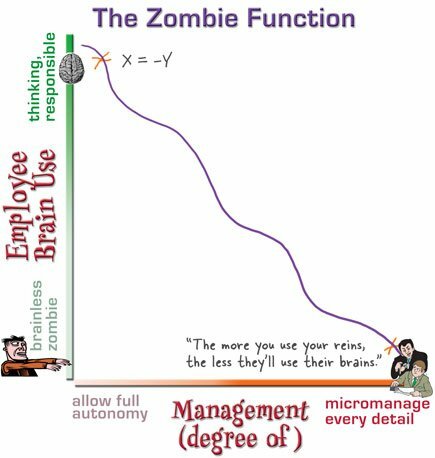 The zombie function is simple, the more you micromanage the employee, the less the employee will think for themselves. The theory says “the more you use your reins, the less they’ll use their brains.” If you’ve ever been micromanaged you know how it can feel to have someone constantly looking over your shoulder. Leaders who don’t trust their employees tend to constantly focus on where their employees are as opposed to the output they are producing. Inc. Magazine has an article by John Case titled “The Open-Book Revolution” where he defines open book management as “a way of running a company which gets everyone to focus on helping the business make money.” Leaders often feel threatened when associates they manage think of better ideas than their own so they instead choose to make decisions in isolation. In doing so, leaders who choose to not get input and feedback are creating zombies. Additionally many leaders feel they know best so they don’t trust their employees to make decisions. Furthermore they micromanage them to make sure everything is done exactly as they would want it done. Don’t get me wrong, employees do need to be overseen and guided. I merely argue that few employees are given proper responsibility and training for that responsibility. They are also not set free and held accountable for what they were hired to do which is producing results (within an agreed upon timeframe). When the idea or decision is eventually communicated without involvement of others in the organization, what typically tends to happen is associates learn to stop questioning, stop thinking, stop caring. When they stop those behaviors they simply start doing as instructed. They become a zombie. Changing things or responding when needed. Whenever possible of course be honest, be a good communicator, keep information you receive confidential, and conduct team building exercises. We know zombies can spread their disease to others and when it does we also know it can spread to customers so cure the problem within your organization before it is too late! So now you know the warning signs, if you see one, or if you are one, get help or help yourself! 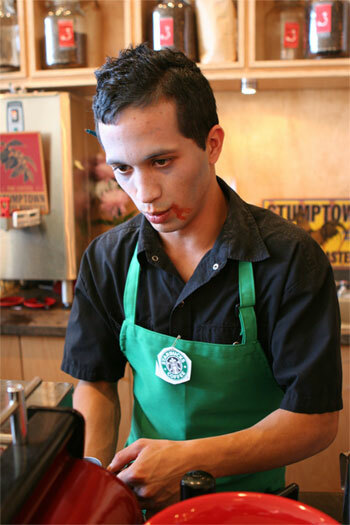 Do you have any thoughts on zombies in the workplace? I went to the mall in San Francisco this afternoon to help my girlfriend pick out some outfits for work and was surprised at what Nordstroms is putting on mannequins these days. What is going through retailer’s minds when they dress these mannequins? Do retailers think this is what people want to buy and wear, or is their strategy simply a marketing gimmick? The outfit on the right is half decent, but what is going on with the one on the left? Even though outfits put on display can be outrageous, what people are actually buying these days tends to be pretty tame. This topic led to an entire discussion on what the current state of fashion really is. I think we are living in a time where people really do have a good sense of fashion, and I’d actually say people are dressing more “normal” than any point in the last 30 years. I know we really can’t define normal but in 20 years if we look back at fashion’s current state will we be able to define it? How would you describe our current state of fashion?